Beautiful certificate from the American Motors Corporation issued no later than 1960. This historic document was printed by American Banknote Company and has an ornate border around it with a vignette allegorical figures next to a gear. This item has the printed signatures of the Company's President, George Romney and is over 50 years old. Mr. Romney was among the luminaries of the national Republican Party after his 1966 election to a third consecutive term as governor of Michigan with a 570,000-vote plurality. But he abandoned his bid for the party's presidential nomination two weeks before the 1968 New Hampshire primary. That was after a three-month campaign that was dogged by his nationally televised comment attributing his initial support for the Vietnam War to his being "brainwashed" by the U.S. military during a tour of the Southeast Asian country. He would later call U.S. participation in the war "the most tragic foreign policy mistake in the nation's history." In a 1989 interview with the Associated Press, Mr. Romney insisted his comments about having been brainwashed had nothing to do with his withdrawal from the presidential race. "It was because Nelson Rockefeller became a candidate, and there was no way I could get the nomination fighting both Rockefeller and Richard Nixon," he said. From 1969 until 1973, Mr. Romney served as HUD secretary. But he left Nixon's Cabinet less than enthusiastic about his federal service, declaring that he looked forward "with great enthusiasm" to his return to private life. Administration support for urban programs had been less than what he had hoped for, he said. In 1974, he became the founding chairman of the Arlington-based National Volunteer Center, an organization that promotes volunteerism. In 1991, the center merged with the Points of Light Foundation, which was supported by President George Bush. A lifelong member and former bishop of the Church of Jesus Christ of Latter-day Saints, Mr. Romney spent two years as a Mormon missionary in England and Scotland during the 1920s. Friends said there was an evangelical strain about many of his undertakings later in life as well. As chairman and president of American Motors from 1954 until 1962, Mr. Romney played a key role in bringing the compact economy car to the U.S. public. He oversaw marketing for the Rambler, which he promoted with a missionary enthusiasm. Lambasting the large chromium-laden cars produced by Ford, Chrysler and General Motors then, he declared: "Who wants to have a gas-guzzling dinosaur in his garage? . . . Think of the gas bills!" Trapped once in a St. Louis traffic jam, he lectured a taxi driver that the mess never would have happened if everyone drove smaller cars. "Next time, try a Rambler," he advised as he left the cab. He resigned from American Motors to run for governor of Michigan and defeated incumbent John B. Swainson un 1962, breaking a 14year Democratic hold on the state's governorship. During his six years as governor, a new Michigan Constitution took effect, civil rights and tax reform measures were undertaken and the state economy improved. As a politician, Mr. Romney had many of the standard attributes: a quick smile, ready handshake and a smooth delivery of speeches. But he also was blunt, unequivocal and often impatient, and he sometimes stepped on toes. As governor, he had office hours on Thursday mornings when Michigan residents could stop by and talk with him for five minutes each. He made a point of shaking hands with schoolchildren who toured the state capitol. In his personal life, he neither smoke nor drank alcohol, and he tithed regularly, giving 10 percent of his income to the Mormon Church. A physical fitness buff all his life, he exercised regularly, often playing golf early in the morning before work. In his later years, he devised what he called a "compact 18" holes, in which he played three balls on each of six holes. Mr. Romney was born in a Mormon community in Chihuahua, Mexico, and he grew up in Idaho and Utah. He attended Latter-day Saints Junior College in Salt Lake City, the University of Utah and George Washington University. While at GWU, he worked in the office of Sen. David I. Walsh (D-Mass.). During the 1930s, he worked for Aluminum Co. of America as a salesman in Los Angeles and later as Alcoa's representative in Washington. During that time, he served two years as president of the Washington Trade Association Executives. Later, he was manager of the Detroit office of the Automobile Manufacturers Asssociation. During World War Il, he was managing director of the Automotive Council for War Production and general manager of the Automobile Manufacturers Assiation. He joined Nash-Kelvinator Corp. as assistant to the president in 1948, becoming executive vice president in 1953. In 1954, Nash-Kelvinator and Hudson Motor Car Co. merged to form American Motors; Mr. Romney became its president and chairmam During the next four years at the company's helm, he took the business from a money-losing operation into prosperity. In the process, he became a wealthy man himself. In that period, Mr. Romney also was chairman of a citizens committee that studied the needs of Detroit's public schools. He led a citizens effort to call a state constitutional convention and subsequently served as a delegate to the convention. In 1931, Mr. Romney married Lenore LaFount, his high school sweetheart. American Motors was formed from the merger of Nash and Hudson in 1954, and ended with the merger of AMC into Chrysler in 1987. Most people, if they think of American Motors at all, remember it as a failure that couldn't compete effectively with the Big 3 and the imports. But it is perhaps more accurate to think of AMC as a scrappy survivor: the last American Independent, the company that outlived Packard, Studebaker, Kaiser, Auburn, Cord, Dusenberg, and all the rest. 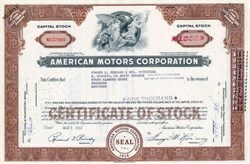 The Good Old Days: A certificate for 25 shares of AMC stock, issued in AMC's early-60's heyday. AMC went through many changes of fortune and focus in its 33 years. After a very rocky start that saw the old Nash and Hudson brands fade away, the company found its niche as a specialty maker of small, practical Ramblers, and sales quadrupled in just a few years. The early 60's were AMC's glory years, when Rambler twice took third place in model year sales and the whole line earned Motor Trend's "Car of the Year" award. But the company soon lost its focus, and sales tumbled. The Rambler name was phased out, replaced by "American Motors" as the brand, and later "AMC". In the late 60's and early 70's AMC had a brief but memorable flirtation with high performance and racing that produced collectible classics like the Javelin, AMX, SC/Rambler, and Machine and brought younger customers into the showrooms. The company enjoyed another brief heyday in the economic recessions of the 70's, again because of its reputation for practicality. AMC's two most unusual cars of that decade, the Gremlin and Pacer, have become pop-culture symbols of the era of arena rock and disco. AMC ultimately couldn't cope with the double whammy of foreign competition and federal safety and environmental regulations, and it had to evolve yet again to survive. In its final years, AMC was primarily a manufacturer of non-AMC vehicles: cars designed by Renault, which bought a controlling interest in the company, and the Jeep line, acquired from Kaiser in 1970. Finally, Renault sold out to Chrysler in 1987, and the Last Independent was history.